However, Kolkata is not the only place which celebrates Anglo-Indian food. A significantly large Anglo-Indian community exists in Bombay, Bangalore and Chennai, as well as other parts of India, where you have different versions of the same dishes or different dishes altogether. For example, I was told by an experienced food enthusiast that the famed Railway Mutton Curry tasted quite different in Bengal Nagpur Railway and the Nilgiri Mountain Railway. Some of the Anglo Indian dishes came by tweaking Indian recipes with less or different spices (even the names got tweaked sometimes, Khichri became Kedgeree, Dal became Dol) and some recipes developed based on place and availability of ingredients (Dak Bungalow Chicken and Bengal Lancers Prawn Curry). Often, recipes from the Blighty were tinkered to local tastes such as Egg Devil, scones and cutlets. The Trident Hyderabad is hosting The Anglo-Indian Food Soiree – a festival to celebrate the subtle taste and flavours of Anglo-Indian food. The chefs at Kanak, their Indian specialty restaurant, have recreated the best dishes of the rich cuisine developed in the kitchen of the memsahibs and their khansamas. I was happy to be invited for a preview of the festival. I had a long chat with Chef Manik Magotra who has put together the menu for this festival. 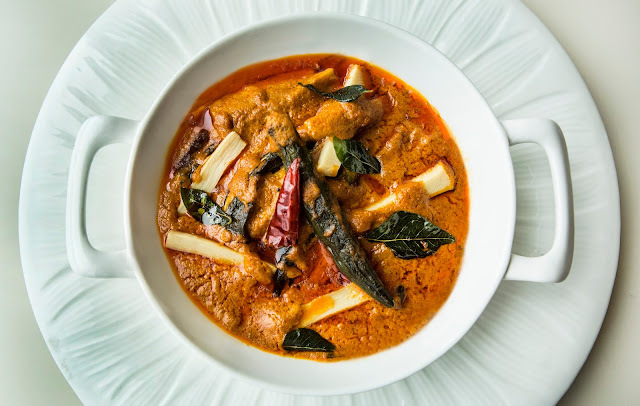 Chef had travelled to Kolkata and talked to various experts of Anglo Indian cuisine to source the recipes, and he has taken care to keep the recipes unchanged. 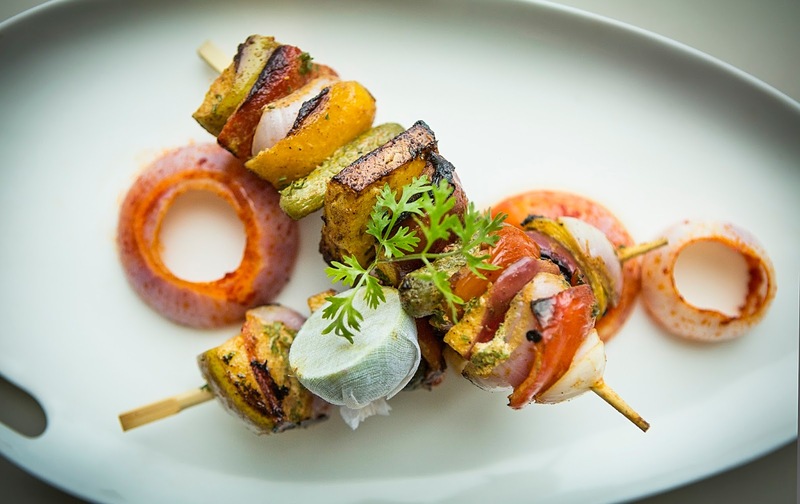 The menu has items from all the different gharanas of Anglo-Indian cuisine – starting from the East Indian Chops to the Fish Moilee from down south. A set meal had been presented to us. We started with Steam Roller Chicken, flattened marinated chicken pieces crumb fried. The chef told us that the name comes from the fact that the chicken used has been flattened out as if under a steam roller. 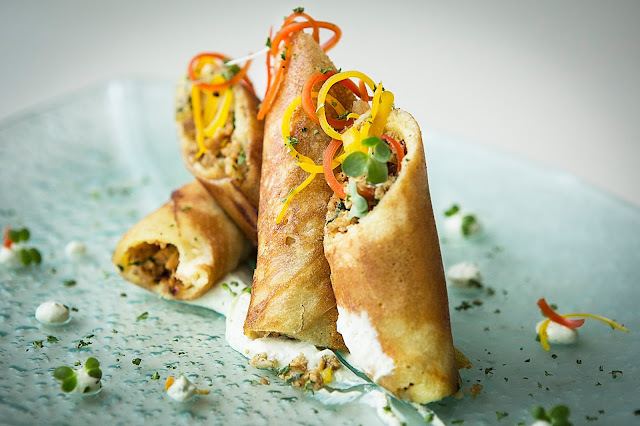 Chicken Pantras was the other chicken dish, essentially crepe rolls filled with chicken mince and spices and pan fried. The dishes were served with some delicious mint and coriander chutneys. Rawalpindi Potato Scones are sautéed flat balls of potato with herbs, cheese and Kashmiri chillies. It is a fusion of Scottish potato scones with the local spices of Rawalpindi, one of the largest cantonments of the British Empire. The Grilled Fruit and Vegetable Salad served with it was delicious with apples, sweet peppers and spiced gherkins grilled on a skewer. The initial settlements of British were in the coastal areas of India, and as a result there is lot of seafood influence in the fusion cuisine. 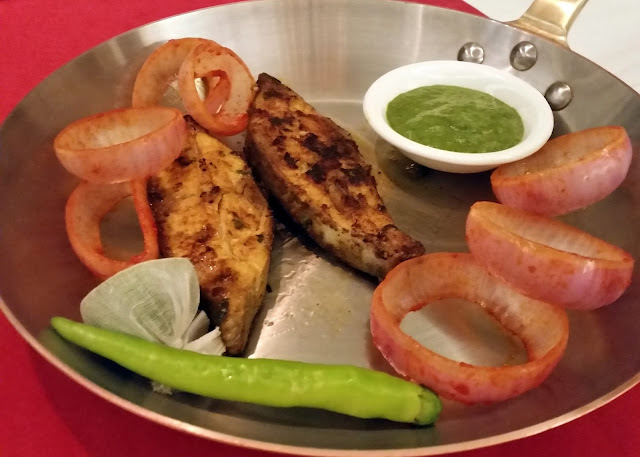 We were served a dish called Travancore Fish Fry, which was fish marinated in South Indian spices and served with a mint chutney. The fish was soft and fresh and had really absorbed the spices well. It was time to bring out the main dishes. Among the vegetarian dishes Bamboo and Bhindi Qorma was a clear winner. The flavorful coconut and cashew nut based gravy had a distinct South Indian taste. Subz and Paneer Jalfrezi, a mixed vegetable dish with carrot, potato, cottage cheese and cabbage was the other vegetarian dish on offer. Dak Bungalow Murgi Roast, was the famed chicken dish of the Dak Bungalows, the small rest houses for postal staff carrying mails which were later upgraded to house British officers. As such, I have had various versions of Dak Bungalow Chicken, as the spices would normally differ based on the state the Dak Bungalow is located. The recipe used here was largely Bengali, and the Chef had decided to serve the potato and the gravy separately from the roasted chicken. The thick gravy in this dish was simple and outstanding and as any Bengali would, I loved the gravy soaked potato in it. 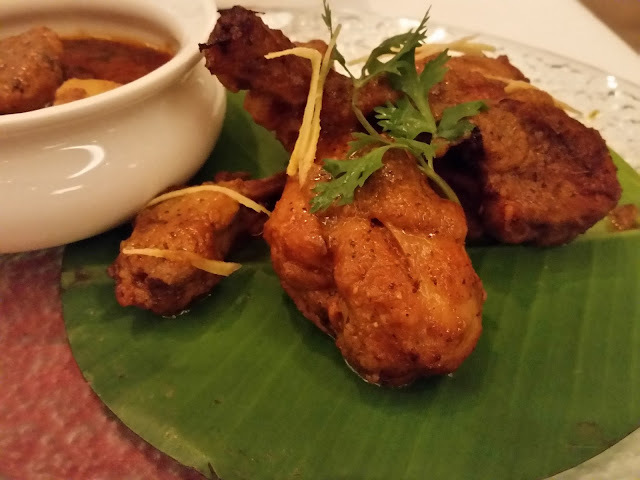 The chicken pieces were drumsticks which were marinated in spices and roasted. 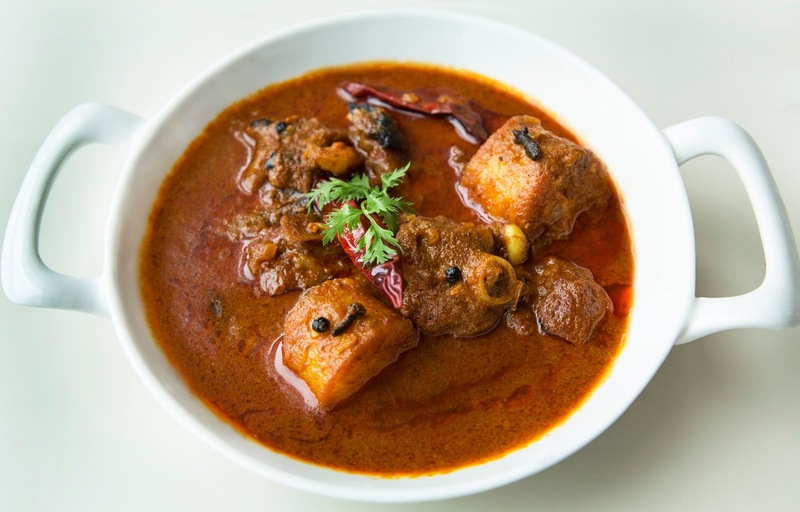 Railway Mutton Curry, is another Anglo-Indian recipe which is quite popular across the country. As I had mentioned earlier, the recipe is quite different in different parts of the country. However the main similarity in them was that they are mild and easy to digest, so that no problems are faced during long train journeys. The mutton curry at Trident was light and nice, using mostly whole spices in the gravy. 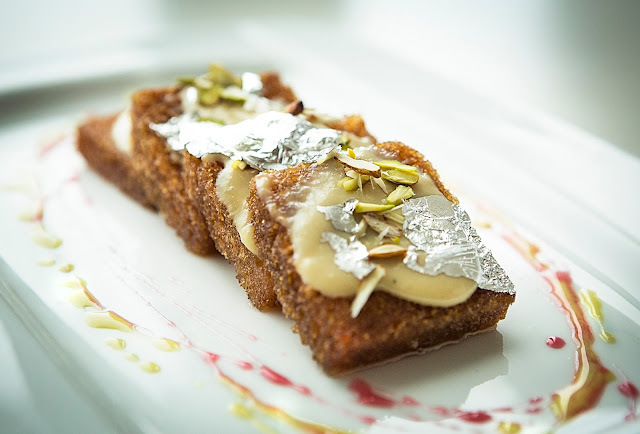 The dessert served in the set menu was Shahi Tukda. The difference of this with the Hyderabadi recipe of Double ka Meetha seems to be the use of rabri on the syrup soaked bread. With the caveat that I am not a fan of desserts, this was too sweet for me. I had a look at the detailed menu. It also had other signature dishes of Anglo-Indian cuisine like Cottage Cheese Chops, Captain Country Chicken and Fish Moilee. Even the Anglo-Indian version of Vindaloo is featured. The festival is a-la-carte but they do offer set menus on request. People like me, who are fans of Anglo-Indian cuisine will surely enjoy this festival. For other food lovers, it may be a golden opportunity to experience a century old fusion cuisine. The festival is on only for dinner from 16th to 28th June.